How do I add a public folder to be migrated? Once a Public Folder Project has been created, click on the Add button and then click on Quick Add. To only migrate all Public Folders, just enter a slash -- which signifies the root of the all Public Folders. Otherwise, when defining the path of the Public Folder, there is no need to add a slash at the beginning of the string: smply enter the folder name followed by a slash and then add sub-folder names. Backslashes are not allowed when defining the Public Folder path. Spaces are allowed in the Public Folder name. The path to the Public Folder must exactly match the path in Exchange for that Public Folder. When in doubt, you can always use the discovery functionality. You can discover Public Folders automatically from the same place you can enter Public Folders manually. 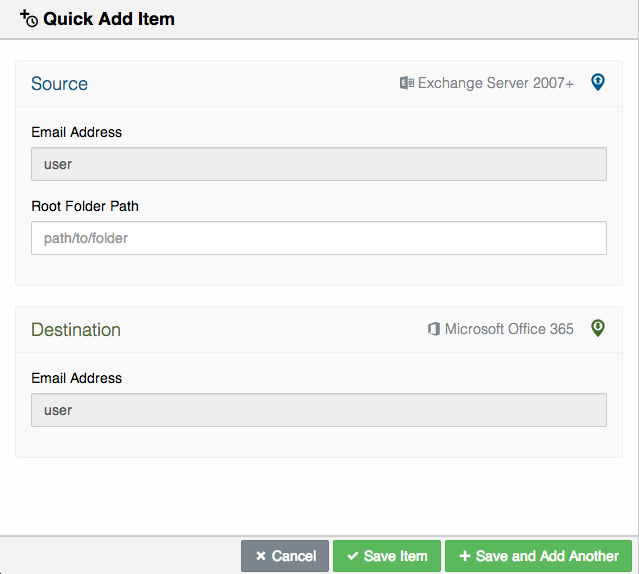 After you have created a Public Folder Project, click on the Add button, and then click on Auto Discover Items. Once clicked, the system will attempt to use the administrative credentials provided to find all Public Folders available at the Source. This operation can take a significant amount of time, so be patient when performing aut​omatic folder discovery. After you have performed folder discovery, make sure that you select all folders that you want to migrate, using the checkboxes to the left of the folder names.